Newsroom employees are more likely to be white and male than U.S. workers overall. There are signs, though, of a turning tide: Younger newsroom employees show greater racial, ethnic and gender diversity than their older colleagues, according to a Pew Research Center analysis of U.S. Census Bureau data. More than three-quarters (77%) of newsroom employees – those who work as reporters, editors, photographers and videographers in the newspaper, broadcasting and internet publishing industries – are non-Hispanic whites, according to the analysis of 2012-2016 American Community Survey data. That is true of 65% of U.S. workers in all occupations and industries combined. Newsroom employees are also more likely than workers overall to be male. About six-in-ten newsroom employees (61%) are men, compared with 53% of all workers. When combining race/ethnicity and gender, almost half (48%) of newsroom employees are non-Hispanic white men compared with about a third (34%) of workers overall. The disparity in race and ethnicity exists across all age groups. Non-Hispanic whites account for about three-fourths (74%) of newsroom employees ages 18 to 49, and they represent 85% among those 50 and older. These shares are lower among workers overall. When it comes to gender, however, younger newsroom employees look like U.S. employees overall. Newsroom employees ages 18 to 29 are just as likely as workers overall to be men (51% in both groups). Among older workers, newsroom employees are disproportionately male: About two-thirds of newsroom employees ages 30 and older are men, compared with a little over half of all U.S. workers. Putting these demographic measures together, 38% of the youngest newsroom employees are both non-Hispanic white and male. This is still a higher share than among workers overall (30%), but this 8-percentage-point gap is smaller than among older age groups. Newsroom employees age 50 and older are 17 percentage points more likely to be white men than all workers in the same age group, while those ages 30 to 49 are 15 points more likely. 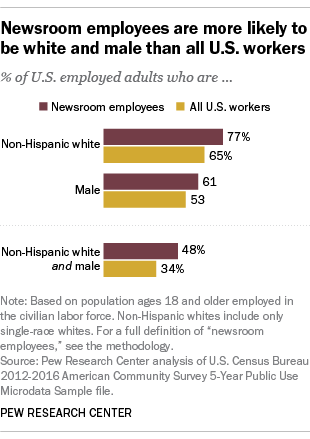 The racial, ethnic and gender differences by age are notable because the bulk of newsroom employees are in the younger age groups. About seven-in-ten newsroom employees are younger than 50: 28% are ages 18 to 29 and 42% are ages 30 to 49. 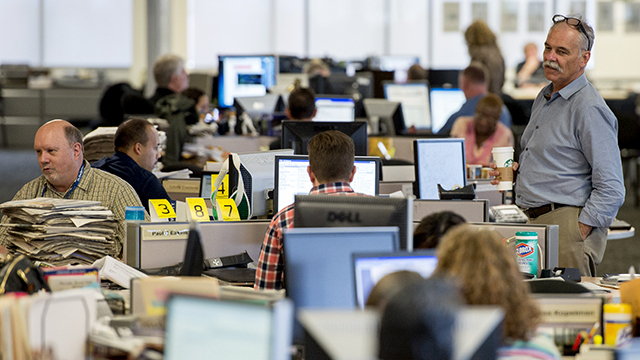 Only about three-in-ten newsroom employees are 50 and older. These data for all newsroom employees tend to correspond with data on specific media sectors. For example, newsroom surveys conducted by the American Society of News Editors in 2012-2015 estimated that newspaper employees were 87%-88% white, 63%-64% male, and 56%-57% white and male. Surveys by the Radio Television Digital News Association in 2012-2016 estimated that television newsroom staff were 77%-79% white and 56%-60% male, while radio newsroom staff were 87%-91% white and 61%-69% male.